After having BKT at Fong Keow BKT Restaurant, we cruised to the next lane/road . Going KFC to buy Pau. 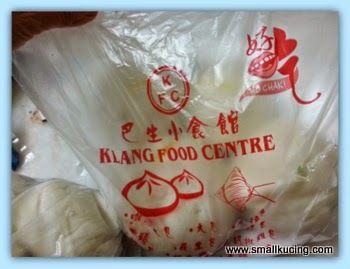 Just found out last month that there is a famous Pau shop here called Restaurant Klang Food Centre. Discovered that in May but Mamarazzi didn't have time to blog about it yet. Don't play play leh....People queue up for this Pau leh. Tourist and local also swamp this shop though there are several pau shops in the vicinity . Must be the good publicity they got from Ho Chiak show and several media publication. Mamarazzi went crazy back then. Borong 3 of each type of pau that were available there. There was the Mui Choy Pau, Char siew Pau, Sang Yuk Pau, Custard Pau, Yam Pork Pau, Red Bean Pau, Vegetable Pau and Peanut Pau. Didn't get Dai Pau(big) and Curry Chicken Pau coz they were out of stock that day. They have Kaya pau too but Mamarazzi didn't order that.Ordered so many till the lady also semput liao. It's nice how they arranged the pau in plates instead of styrofoam boxes that would makes the pau mushy if coop up long. Rating....as good as Tg Sepat Pau . Size also bigger than most pau in KL. Not that pricey also. Bought total of 18 pau. Paid around RM. Average around RM2 per Pau. Okay la. 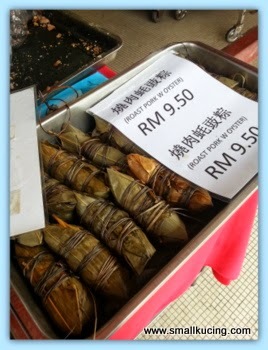 The Sang Yuk Pau, Vegetable Pau and Yam Pork Pau even have hard boiled egg in it. Which Pau we like the most? I like Yam Pork Pau. Mamarazzi likes Vegetable Pau and Sang Yuk Pau. 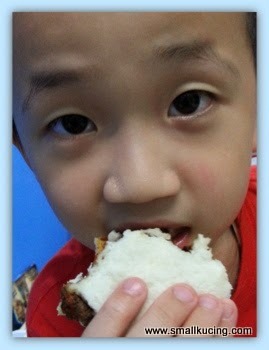 Papa likes Yam Pork Pau and vegetable Pau the most. Apart from Pau, they also have several types of chang and fried stuffs. If you are at that area, Mamarazzi said it's worth a try of their Pau. Here is the address 10, Jalan Batai Laut 5, Taman Intan, 41300 Klang. The yam pork pau uses pork belly for the fillings? Small kucing likes to eat pau or noodles more? Rm2 each on average sounds ok.
That is so funny! 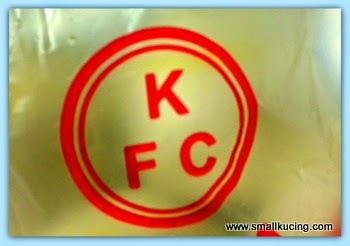 We have really popular restaurants everywhere, KFC, but it stands for Kentucky Fried Chicken. Ohhhhh???? Like that, next time just come here, no need to go to Tanjong Sepat anymore. Nearer, right? Uiiks, I thought what KFC pau.. Ingatkan home-made pau, with KFC shredded chicken meat inside or something..
Before I read your post, I was thinking of home-made pau (with your breadmaker), with leftover KFC shredded meat inside, together with some mayonaise or sweet sauce or something new that mamarazzi invented.. Hehe..
Oohh, I heard of these from my colleagues also.. Next door to the BKT will be a place selling pau.. Maybe this is the place they always talk about.. Let me ask them later..
Got fried chicken inside ? 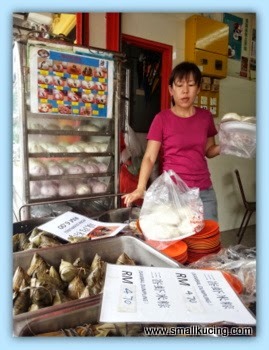 ya, this pau shop is very famous in Klang..
Wonder how the yam pork taste like.. kau yuk pau? Do they put a piece of yam inside? Wah buy so many pau. I like bak pau with egg inside. I have tried all the paus there but I have different ratings for each type. All are good and char siew pau is the best to me. Do you know that almost all the good paus in Klang Valley comes from one supplier in Tanjung Malim? 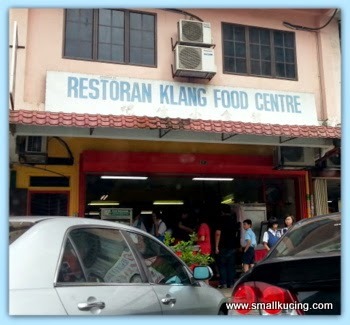 I went to their factory in Tg Malim to eat on the spot and it tasted heavenly different! wah, Mamarazzi gila pau ke?? bought 3 pau for each variety!! hahaha, sure everyone was looking at this Auntie Borong, and all hate her because she is causing the queue to go slow because the lady boss gotta tapau so many pau for her.. oooh, so she placed the pau on a plate and then wrap inside plastic bag?? hmmm, clever idea, prevents the pau to be trapped inside the heat and steam.. and makes eating them on the spot to much more convenient..
wah, many different types of pau that Uncle SK has not tasted before leh, actually just the Mui Choy and Yam Pork only lah.. wah, maybe when Uncle SK is hungry ah, he can wallop one pau from each of the varieties leh.. they don't look fancy but Uncle SK think they taste great.. the yam pork pau has got two votes woh, means this one is the best ah?? eh quite big leh....sure can eat so many? 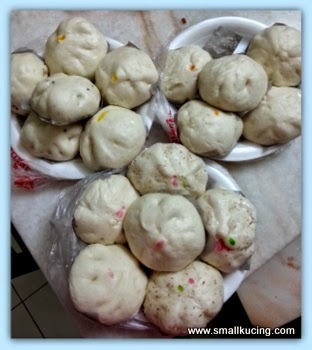 Ok, next time got chance must go buy this pau, Aden and I love pau, hehehe! I would like to try the Red Bean Pau. I would probably like to try them all.